Kissimmee stands on Lake Tohopekaliga at the end of the Orange Blossom Trail, in Osceola County, Florida (FL) and Kissimmee is centered around the US 192 / Irlo Bronson Memorial Highway. 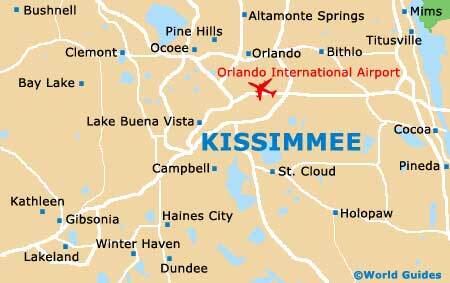 Standing closer to Walt Disney World than nearby Orlando, Kissimmee is often overlooked, although it offers cheaper, more convenient accommodation for those visiting the Magic Kingdom. Once a major cattle center known as 'Cow Town', Kissimmee now features its own places of interest, which increases its attractiveness and add to its visitor appeal and tourist numbers. 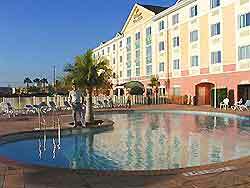 Many hotels can be found in the Kissimmee area and on the city's outskirts, close to Orlando. Concentrated in and around the city center, further accommodation can be found along El Mar Drive, the Kissimmee Beach Boulevard, the North Ocean Boulevard, the Seabreeze Boulevard and South Ocean Lane. Kissimmee vacation rentals remain popular all through the year, offering spacious surroundings, private swimming pools and easy access to the Disney attractions. 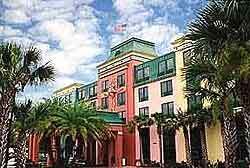 More information about Kissimmee Hotels. Tourism is a major particular of Kissimmee life and being so close to neighboring Orlando, Kissimmee has become a popular destination for day trips and excursions. The main tourist information center is the Kissimmee Convention and Visitors Bureau along East Irlo Bronson Memorial Highway, which offers an array of the latest tourist information, including Kissimmee's top tourist attractions and sightseeing opportunities, what to see, where to stay, Florida visitor tips, travel information and general Kissimmee tourism advice. Kissimmee has plenty of top tourist attractions, including Boggy Creek Airboat Rides - various guided airboat tours around the scenic Florida Everglades; Capone's Dinner and Show - a truly unique, themed Kissimmee experience of mobster life in the 1920s; Gatorland - a popular alligator park with a number of other wildlife attractions, on the Orlando / Kissimmee border; Congo River Golf - the ultimate crazy golf experience, amid lush tropical landscaped gardens; Fun 'N' Wheels Fun Park - a fast go-kart racing track with video arcades; and Kissimmee's Medieval Times - a dinner and show that transports visitors back to Medieval England, with knights, jousting and festivities. Other major tourist attractions in Kissimmee include the World of Orchids - a must-see for horticulture lovers visiting Kissimmee, with a large conservatory; Reptile World Serpentarium - an impressive collection of creepy crawlies and snakes; Kissimmee's Osceola County Courthouse - a striking red-brick building dating back to the late 1880s; the American Legion Home - a grand, historic structure, with monuments remembering Kissimmee's WWI heroes; Bataan Corregidor Memorial - a tribute to Americans and Filipinos who lost their lives during WWII; and numerous green spaces, such as Brinson Park, Lakefront Park, Lake Kissimmee State Park and Makinson Island. 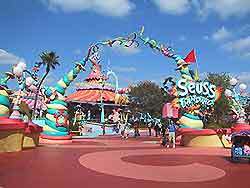 More information about Kissimmee Tourist Attractions and Kissimmee Landmarks. Some of the most popular museums and art galleries in Kissimmee include Osceola County Historical Museum and Pioneer Center - with information about the rich heritage of Osceola County; the Veterans Tribute and Museum of Osceola County - a small facility in Kissimmee, where visitors can view artifacts from a variety of US conflicts; G.A.R. Museum - close to Kissimmee, in neighboring St. Cloud, with a host of important memorabilia about the American Civil War; the Orlando Museum of Art - close to Kissimmee, one of the best art facilities in the whole of Florida; and Kissimmee's Osceola Center for the Arts - dedicated to promoting interest and local artists in the Osceola County area. More information about Kissimmee Museums and Kissimmee Art Galleries. Tourist attractions located nearby Kissimmee include Cocoa Beach - a long stretch of coastline with a thriving surf scene close to Kissimmee; Disney's Epcot Center - a combination of entertainment, educational information and science fun; Disney's Magic Kingdom - one of the most famous tourism theme parks in the world, just a short drive from Kissimmee; Disney's MGM Studios - with interesting behind-the-scenes tours of the studios, rollercoasters and live shows; Downtown Disney - a major complex opening each evening for night time entertainment and fine dining; Universal Studios - within easy reach of Kissimmee, full of interactive shows, exciting attractions and fast rides; and Wet 'n' Wild - one of Florida's best water parks, with thrilling water rides and attractions. More information about Kissimmee Attractions Nearby.